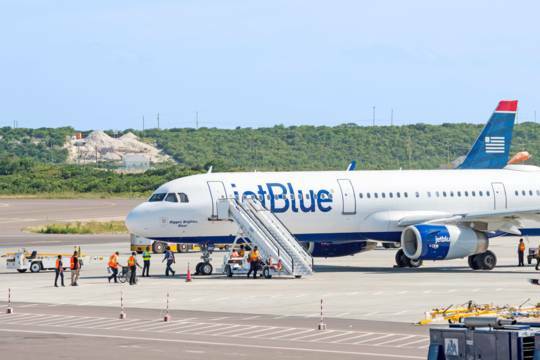 A JetBlue Airways Airbus A320 taxiing at the Providenciales International Airport. Airliner over Chalk Sound National Park. The view when approaching Providenciales is unforgettable. Nearly all visitors to the Turks and Caicos arrive by either plane to the island of Providenciales, or by cruise ship to the island of Grand Turk. See Getting to Providenciales and Getting to Grand Turk. The Turks and Caicos is a very easy destination to visit for residents of the United States, United Kingdom, and Canada, as visas are not required for citizens or legal residents of these countries. 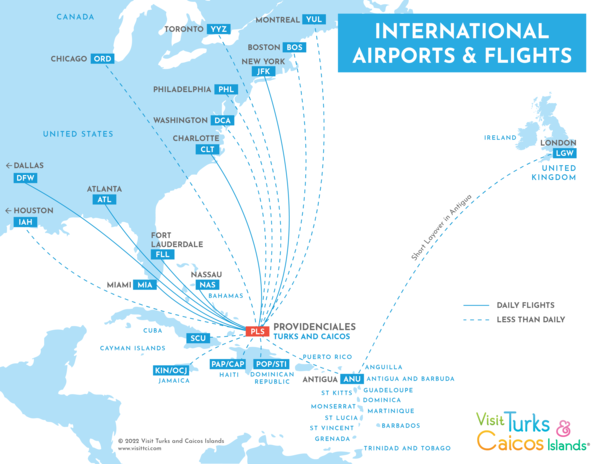 All scheduled international flights into the Turks and Caicos land at the Providenciales International Airport (PLS). There are currently flights offered from many major United States cities, as well as the United Kingdom, Canada, Bahamas, Jamaica, Dominican Republic, Haiti, Cuba, and Antigua. 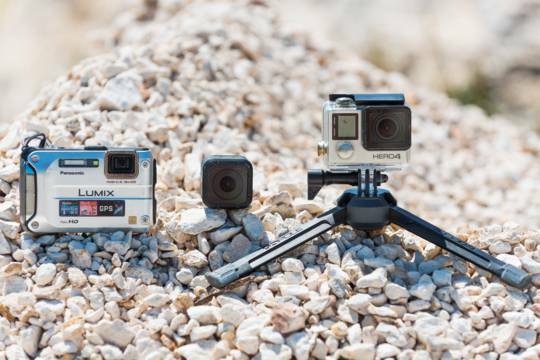 You'll need a valid passport and return/onward ticket to enter the Turks and Caicos Islands. Many nationalities do not need a visa (including the United States, Canada and the United Kingdom), yet we recommend that you verify before booking your tickets. See Passports and Visas. Once you arrive at the airport, you’ll have to clear immigration and customs. There may be a bit of a wait if several flights have recently landed, yet the customs and immigration process is typically simple and easy. As is the case in most countries, you’ll be required to fill out basic immigration and customs landing cards. 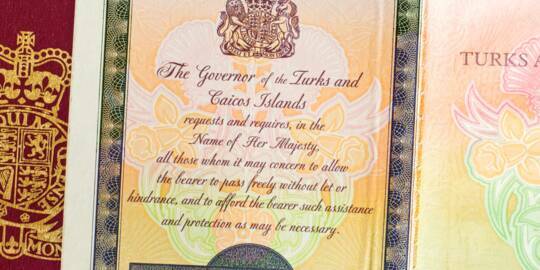 There are limits on the amounts and types of goods that can be brought into the Turks and Caicos duty-free. See Customs Allowances. If you're traveling with pets, you'll need a veterinary certificate stating your animal is in good health. See Travelling with Pets. Flights are available from Providenciales to the other main islands in the country. See Domestic Flights and Ferries. Ocean liner at the Grand Turk Cruise Center. 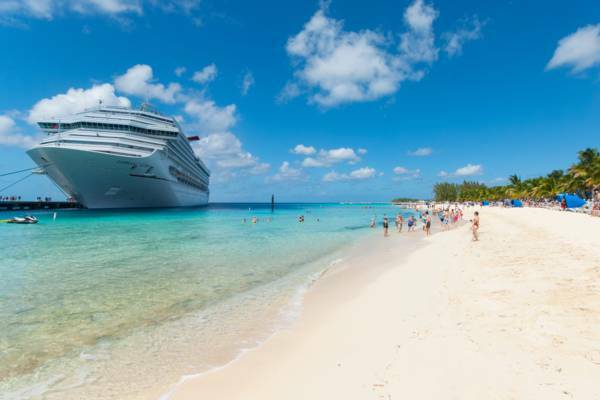 Grand Turk is the only island in the country with a cruise ship port. All cruise ships to the Turks and Caicos arrive at this site. All immigration and customs matters are handled by the cruise lines, so it's a breeze to land. Most stays average about six hours, which leaves plenty of time to see the the beaches, sights and attractions of Grand Turk. Due to time constraints, it's really not feasible to visit Providenciales or any of the other main islands in the country. A yacht moored in Leeward Channel. 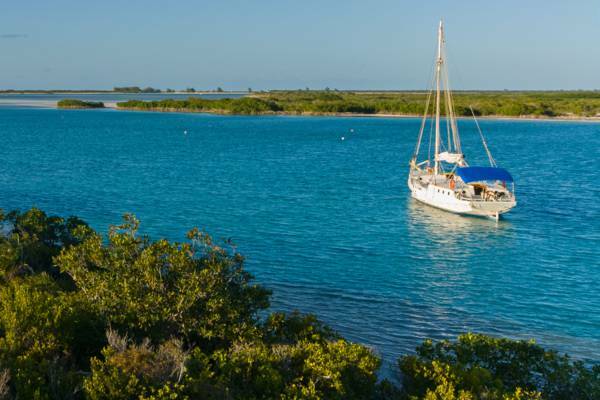 The Turks and Caicos is a great destination for yachts and cruisers, offering many marinas throughout the islands. Your initial stop, once you arrive in the islands, must be at a port-of-entry. There are several such marinas on Providenciales and Grand Turk, and one each on North Caicos and South Caicos. The harbourmaster at the port of entry has the authority to grant leave to enter for one-week. If you wish to stay longer or cruise among the islands, you must get a Cruising Permit (valid for 90 days), and/or visit one of the immigration offices on Providenciales or Grand Turk. The waters around the Turks and Caicos have many reefs and shallow hazards, so having up to date and proper charts and GPS is highly recommended. Providenciales and the other main islands in the Turks and Caicos have become a popular destination for private and charter planes. 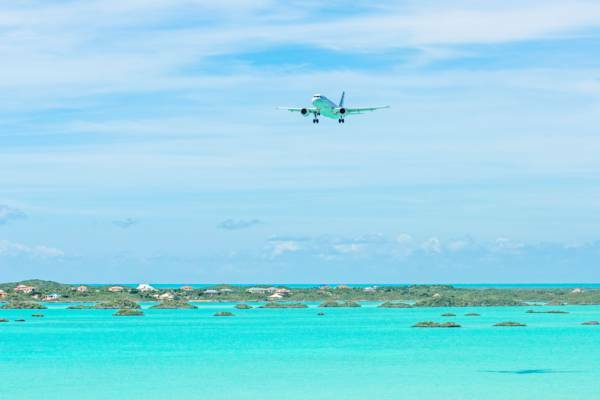 There are several fixed-base operators (FBO) on Providenciales to choose from, each offering fuel, immigration and customs clearance and other services.